Sebastian Janikowski exists to blast long field goals and basically do nothing else. He’s also 40 years old. 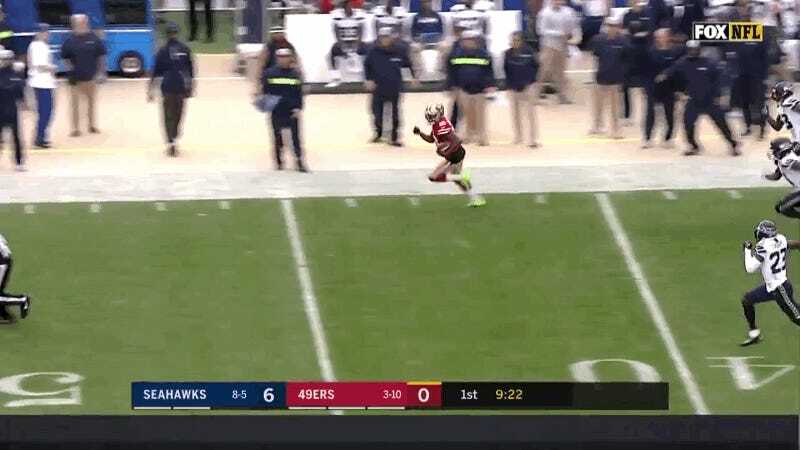 Sure, it would’ve been nice if he tried to tackle 49ers kick returner Richie James Jr. on this 97-yard touchdown, but that’s asking a lot. It’s not clear if Janikowski even intentionally tried to close off James. If he displayed any hustle, it was so he could get to his team’s sideline faster. Oh, and this happened right after the Seahawks kicker missed the extra point on his team’s TD. Credit to Thom Brennaman, who really tried to sell, “He has Janikowski to beat,” as if it were close.